Savoury mushrooms, garlic and sea salt combine to make a fragrant, rich broth worthy of your favourite soups, risottos and pasta dishes. Ingredients: Water, organic mushrooms, sea salt, organic garlic. Love this stuff in almost everything that calls for broth. I would give it a 5 star if it came with 1/2 of the salt. Its NOT salty, but would be better, for people watching their salt intake. Found this quite by accident. Didn't even know it existed. 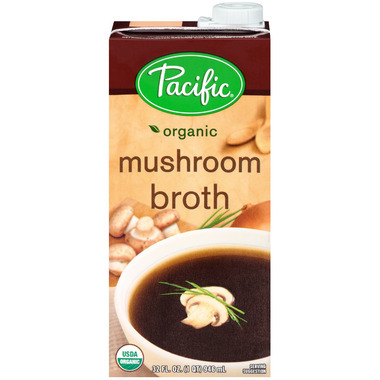 I prefer Pacific brand (over Imagine brand) because the chicken and vegetable broths I've used for years have better/more flavor. My regular organic store had run out of Pacific chicken broth so I thought I'd try Well.ca. Weelllll... that's how I found the mushroom. Thought I'd give it a try and bought two. Fell in love... great taste and also the one with the absolute least ingredients!! Mushrooms, water, sea salt and garlic. Very basic. Very delicious. Use it as a soup base and for cooking instead of water. THEN... bought 4 more (just arrived yesterday). While writing this I noticed it's on sale so I'm ordering 6 more. Have I mentioned I love this stuff? Ditto for my husband. It just adds a nice full bodied flavor to everything I use it in. PLEASE don't stop carrying this particular flavor!!! This is my second review for this product. This mushroom broth is now a staple in our pantry. I use it in place of fats or water for cooking and we find it quite versatile. This and the low sodium vegetable broth are the best. Keep them in stock please Well.ca! This mushroom broth is quite nice. My husband really enjoys making, what else, mushroom soup with it. It is an excellent broth to enhance the flavor of just about anything you make. The ingredients are perfectly simple. 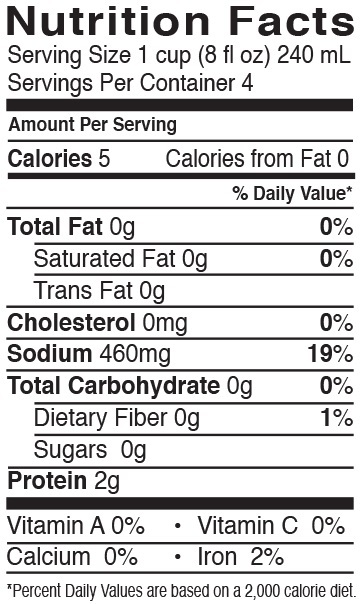 The sodium content could be lower, but at 460mg/cup it is still much lower than other brands. This product has a wonderful, surprisingly intense flavor. I use it instead of water when I'm making rice or quinoa - it takes grains to a whole new level! This is a great basic broth for use in soups, stews, chowders and casseroles. Well.ca has the best price I've seen. This is a great basic broth to use in cooking. I make soups with it and also casseroles.